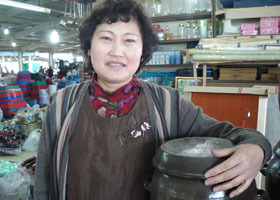 Han Ok-soon is a strong-willed woman with a warm heart and a big smile. Those attributes have proven essential to her survival. "Many women in multi-cultural families feel disheartened to see that there exists some sort of prejudice against them because of a different language, appearance and cultural background. The first time I came to Jeju, everything was frustrating. But I soon changed my mind," she said. Han was born in China to Korean parents, but came to live in Jeju with her Korean husband 14 years ago. To the close-knit Jeju community, she was an outsider. "It took me quite a while to understand Jeju dialect, even though I am pretty good at Korean. Jeju dialect is so distinct from Korean standard language," Han said. "One day, an elderly Jeju woman said to me "Sogak-tta" which means "being cheated" in standard Korean. Her words really upset me at first, because I didn't know that it means 'you are a good person' in Jeju dialect. Isn't it interesting?" While Han speaks good Korean and even Jeju dialect, most of the immigrant women from Vietnam and The Philippines find it difficult to integrate into Jeju society due to the language barrier. Also, their children 's education is an additional hurdle to overcome. 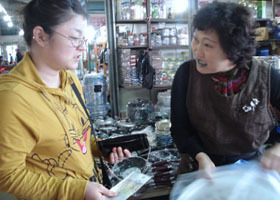 She keeps busy working at the five-day outdoor market in Hallim, taking care of her kids and doing community service. She also works hard to see that Chinese-Korean women living in Jeju have a voice in their community, and she is a role model of what they can achieve. Han is the first Chinese-Korean president of the Wives Association of Aewol Village in Jeju. She has also taken the immigrant womens’ voice all the way to Seoul. Last year she was invited to the inauguration ceremony of Korean President Lee Myong Bak, along with another immigrant woman from The Philippines, on behalf of immigrants living in Jeju. She currently works as a member of the Multicultural Family Support Group established by the Jeju provincial government. She also helps many married immigrant women through The Immigrant Center, a state-run body established to improve their rights and living situation. "In Hallim, where I live, there are more than 30 immigrant women. It's not a few people. And that's why the Jeju government works out many positive policies for multi-cultural family," Han says. As a wife and mother of four children, she'd been through hard times since coming to Jeju 14 years ago. At that time, few immigrant women lived in Jeju. Living with prejudice and a harsh life was a struggle for her, but after many years, she has become recognized and appreciated by Jeju people as well as her family. Asked to tell what's behind it, she emphasized the importance of being positive and having one’s spouse's support to fit into Jeju life. "I'm trying to make the immigrant women think positive in their lives," Han said. She thinks Jeju is a beautiful place to live; the people are very nice and the environment here is clean. "I am so happy to live on Jeju Island. I know it's a totally different world from my hometown in China where there is significantly less freedom and more restraints from the government," she said. For the increasing number of immigrant women marrying into Jeju society, Han is someone they can look to for support, and inspiration.